I stopped into Mission Possible recently and found some incredible items I had to share. Like this full size bed for less than $150. It had a few dings but wow. 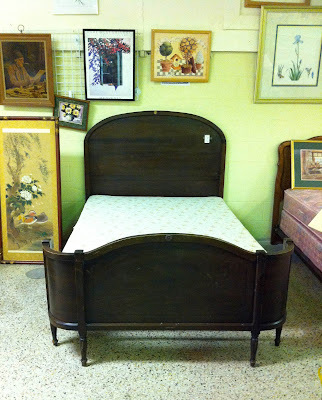 I think this twin bamboo headboard was only around $10 or so! This is pretty on trend now (people are incorporating those Golden Girls chairs into beautiful spaces). With the right surroundings, this sucker could look so chic. You're going to think I'm crazy. But I've been thinking of this sofa ever since I laid eyes on it. 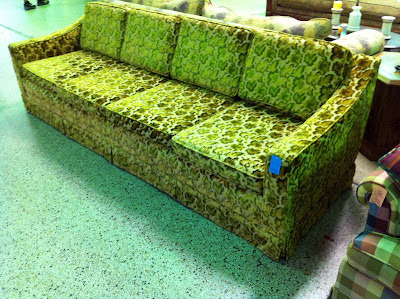 My initial thought was "ugly sofa, but it has great lines. Good candidate for reupholstery (in which case I would consider making two large cushions instead of four). 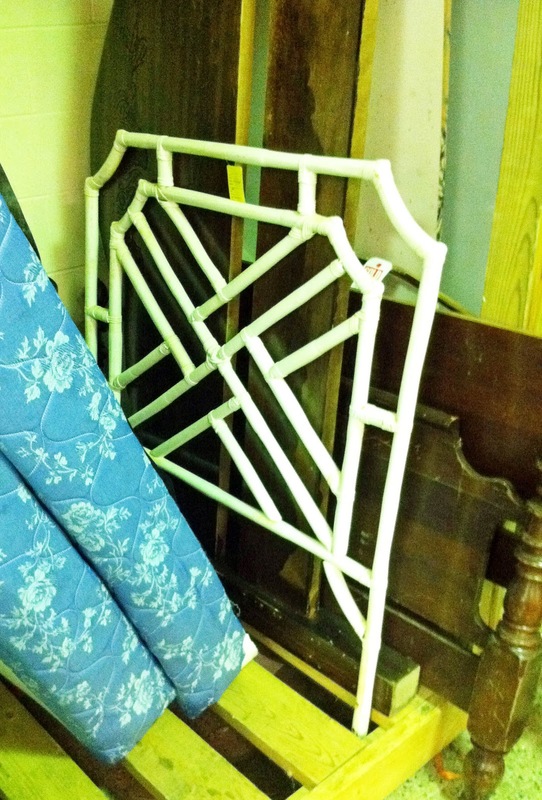 But the more I looked at this thing... it's kind of rad as-is, and could look great with some kitchy pillows and modern accessories surrounding it. The color isn't great in this photo, but it gives you an idea of the green velvet color that is so on trend. Any recent or favorite thrifting finds? Do you think the green sofa totally ugly or totally chic? I'll admit, it's not as much fun when I leave empty-handed... but it's worth the hunt for the times you find those perfect items, right? Dining Room Updates - Curtains & Rug! I Love Thrifting Party Recap!